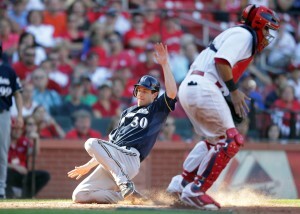 Randy Wolf allowed one run over eight innings and Ryan Braun and Nyjer Morgan each homered to lead the Milwaukee Brewers to a 4-1 win over the St. Louis Cardinals on Monday. The Brewers won their fourth straight to move 10 1/2 games ahead of St. Louis in the NL Central, tying their largest lead of the season. Wolf (12-9) gave up four hits, struck out five and walked two as he improved to 6-1 with a 3.11 ERA in his last eight starts. The left-hander allowed just two hits over his final six innings, and also had a pair of infield singles. Cardinals starter Jake Westbrook (11-8) gave up three runs and on nine hits in six innings. He tied a career high with nine strikeouts.